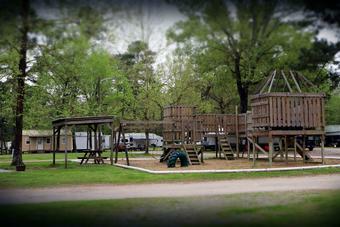 Cajun Campground has been providing camping fun for folks for over thirty years. The park is situated on 40 acres. We are located six miles east of Eunice, La. On Hwy. 190. When you arrive at the office either Mrs. Rose or one of our friendly associates will be more than happy to check you in and answer any questions you may have. 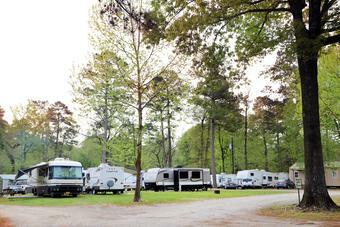 Our campground consists of 135 camping sites, most are full hookups with plenty of space between campers. If you have several campers coming as a group we can provide you with one of our five pavilions that accommodates group camping. We also have seven cabins with bathrooms and kitchenettes. 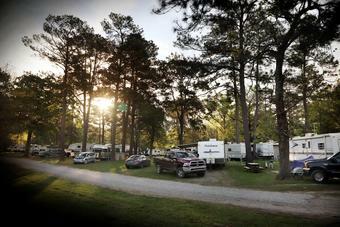 Our mature trees throughout the campground makes for a great outdoor experience when either grilling steaks, barbequing, boiling crawfish, frying fish, or just relaxing. The game room allows for friends, family and yourself to enjoy the indoors, while playing a game of pool or playing different arcade games. There is plenty of area for the older children to ride their bikes and a spacious playground for the younger children. We also have a nature trail if you enjoy taking a stroll. For the fisherman in your family there is a pond. There is also mini golf and peddle boats to enjoy. Our in ground pool will provide fun for the entire family. If you get hungry while swimming our concession stand will provide food and refreshments. Can’t do without the Internet? We have WIFI at no extra charge. If you run out of propane while cooking, no problem we can fill your bottle from our bulk propane tank. After having such a good time at Cajun Campground, you might decide to stay longer than planned, don’t worry about not having any clean clothes because our park has two laundry facilities. Come pass a good time at Cajun Campground!!!!!! !